Back Issue Bin to the Future is BACK, ladies and gentlemen, and what better way to return than with this brutal first issue of the still ongoing series by Erik Larsen! In earlier Back Issue Bin articles, we’ve taken a look at some of the other 1st issues from the very start of Image: Spawn, Shadowhawk, even Youngblood. We never forgot Larsen though, with a review of his character Star, who came straight out of the pages of Savage Dragon, or the interview we scored with him, but I think we need to take it right back to the start for Erik at Image. After all, he is one of the founders of this great comic company, and what better way to see what he did hot off the heels of his work on Spider-Man? So sit back, strap in, and get ready for intense action as we look at Savage Dragon #1! Here’s how it goes: It all starts off with a bang. We’re tossed right into the middle of the action as Savage Dragon leaps into the middle of chaos. Cops have been killed. Money is in the process of being stolen, and some real nasties by the names of Cut-Throat and Glowbug are responsible for it all. Over the next six pages, it’s action that Bruce Willis or Stallone would be proud of as our hero beats the ever lovin’ crap outta these two. It’s a few cuts and bruises for the Dragon, but soon to be all in a days work for the rookie cop. That’s right, Savage Dragon is a badge wearing member of the Chicago Police Force. His day is just getting started. Erik Larsen takes on the duties of not only creating this character, but the writing, penciling, and inks as well. Let’s cover the story first. Right off the bat, Larsen puts us in the heat of the moment. The script is a sign of the times, but that’s not bad. It’s full of action, and even some cussing, the likes of which hadn’t really been seen before in the bigger two of Marvel and DC. No comics code here means that the story might actually have a little room to breathe. It’s violent, but that really is the point of a super powered cop taking on a city full of villains bent on taking over the city, right? But that’s not all. Larsen treats us to a little back story as he takes us to what is the beginning of the Savage Dragon in Image lore. We’re not given much, but with what we are told, we know about as much as the Dragon does about himself. He doesn’t know where he’s from, who he is, or anything about him, but he knows pretty much everything else. The point is, though, we don’t need to know much about him to start with. A solid foundation is laid out for the series right off the bat. Larsen gives us a brief history of the world the Dragon lives in, the heroes that have come before him, and the hard road that lays ahead. It’s such a good start. Erik Larsen’s artwork, in my opinion, is unmatched. It’s most certainly a style all his own, and to have it accompany his words to this issue makes everything stand out. His action is intense. Fists flying, blood splattering, expressions expressing (hehe)… It all fits. It’s not just that though. When the action stops, the artwork doesn’t slow down. As we meet Lt. Frank Darling, and his questioning of the Dragon, you can see the helplessness and frustration on each of the characters. With his take on heroes and villains in this world, Erik Larsen’s interpretation is pretty unique. The Patriot and Mighty Man could be said to be copies of the likes of Supes and Captain America, but honestly, is that really a bad thing? Any universe needs heroes like that, and I see it as more of a nod to those characters than anything else. Either way, Larsen makes them his own and fits them properly into the Image Universe. Let’s not forget the villains. Cut-Throat looks great. The two other villains Dragon beats the snot out of at the shipping yards look awesome. Larsen just knows how to draw, and he knows how to make it look good. Erik Larsen’s work on Spider-Man was great. After McFarlane left Amazing to work on the self-titled Spider-Man series, the artwork duties fell to Larsen to continue. He held strong, and gained a huge fan following in his own right that followed him right to the creation of Image and down to the pages of Savage Dragon. Savage Dragon wasn’t created on the fly just for Image though. It was a creation that spawned many years, starting in homemade comics in elementary school, to the pages of Graphic Fantasy and Megaton. Everything lead up to what I’m reviewing now, and I gotta say, I like what I see. 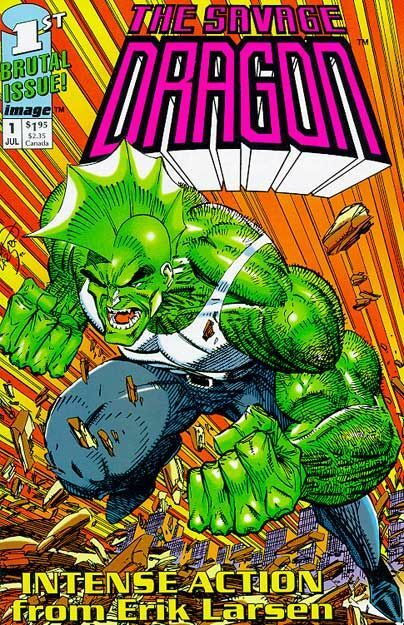 With intense action, a solid storyline, and seriously devoted fans, Savage Dragon has endured right up to the present. As of the release of this article, Savage Dragon is currently at it’s 184th issue. That’s pretty good if you ask me. The continuing story of the Dragon is just as rich as its start, most of which can be found for pretty reasonable prices at comic shops everywhere. It’s a great start to a great series… What more could you ask for? Parental Concern: Lots of violence and blood, but nothing that’s not already in a comic now, right? Yay!!! Tim’s back! Fun choice to kick things off! I thought so! It’s a great series, and such fun to read. It’s not like the other ones that really tried hard to have a serious tone. Here, I think it fits the comic book image quite nicely. It’s superhero, it’s fun, action packed, and wild to read. I was never really a fan of Larsen’s art during his Spider-man days but loved it when Savage Dragon came out. For me it was a combination of him inking his own stuff and starting to really let loose with his page layouts. Good call on Larsen’s scripting too. I feel he’s really underrated in that regard and IMO was/is miles better at writing than the other image founders in that he can tell a clear story with interesting characters, subplots and satisfying resolutions. I also love how the tone of this series has changed throughout the years . As you say the early issues are of their time i.e. grim and gritty but they aren’t overbearingly so and are definitely amongst the best of that era. Larsen never forgot that comics are supposed to be fun no matter what direction he’s taken. Thanks for the memories! No problem, Bruce! I agree 100% with your final statement: “Larsen never forgot that comics are supposed to be fun no matter what direction he’s taken.” That sums it all up, right there. Very cool feature! I think it says a lot that the Dragon is still running on Larsen powah! It is inspiring that he stuck by his book and his fans when most if not all of the other founders of Image flaked out. -Staying true to HIS creation. You simply don’t see single creator-owned books lasting this long (or mainstream books with one creative team for that matter). -The book takes place in real time! -Lasting, meaningful consequences, dead characters stay dead (for the most part). -As alluded to before – FUN! To this day one of the few books I look forward to reading simply for the fact that it is fun!